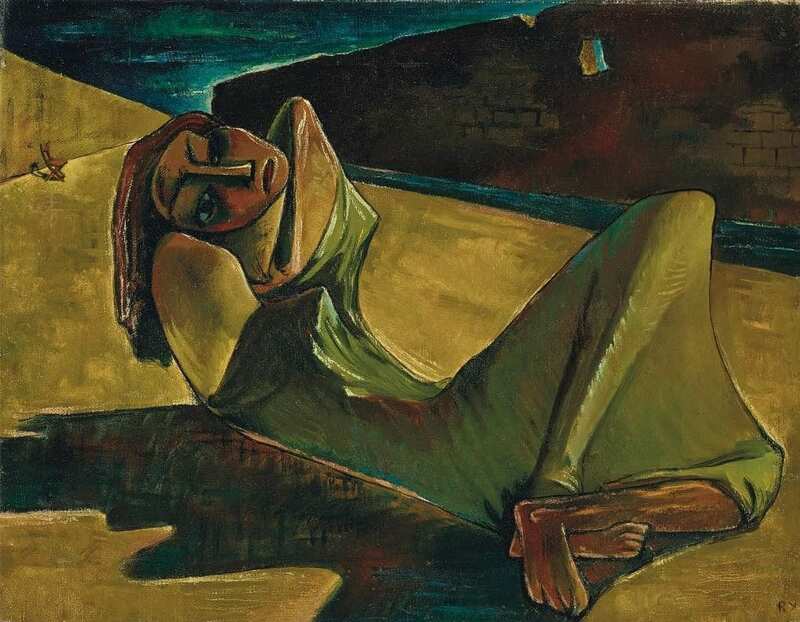 DUBAI- Christie’s Dubai Middle Eastern Modern and Contemporary Art auction took place on March 23, and offered a selection of paintings, prints, sculptures, photographs and drawings by leading artists. The auction featured works by the likes of Paul Guiragossian, Adam Henein, Etel Adnan, Marwan, Hussein Madi and Reza Aramesh. Our artmejo contributor Felix Goodman met up with Suzy Sikorski, Junior Art Specialist at Christie’s and the founder of mideasart in Dubai and talked to her about all things art. Sikorski shared with artmejo highlight pieces showcased at the sale and some background details on the artists behind them. You can watch the takeover on Instagram here. 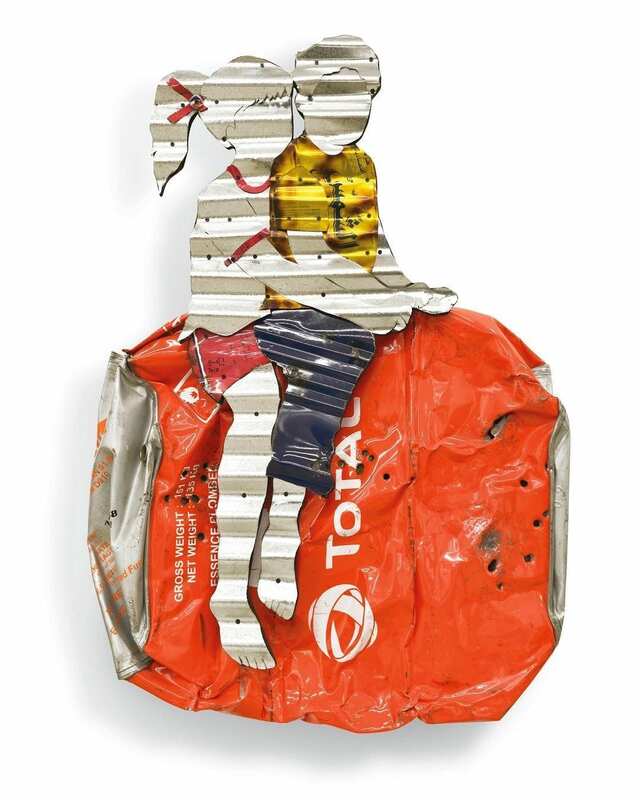 This playful work by Palestinian artist Abdelrahman Katanani is created from objects found in refugee camps. 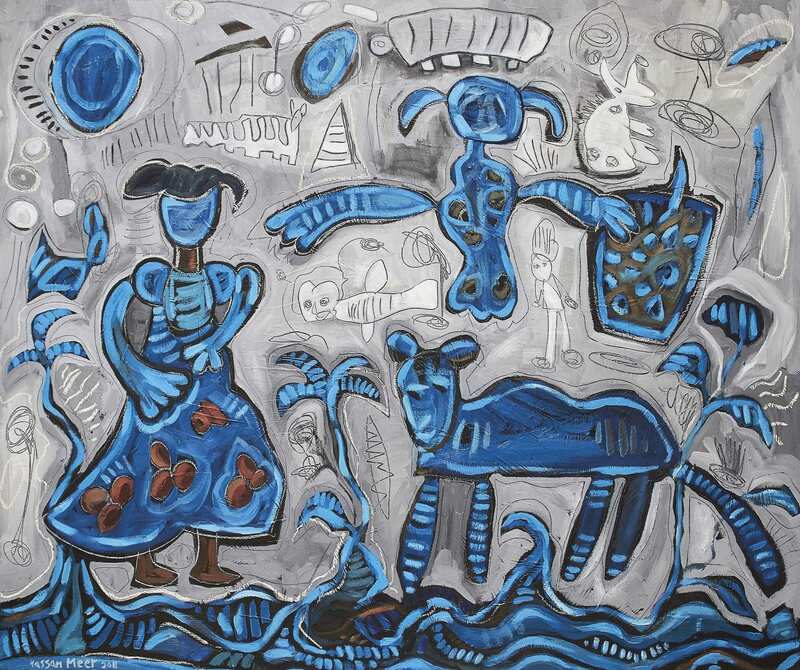 The artist grew up as a refugee in the Sabra and Shatila camp, and from his early childhood showcased an interest in creating art from found objects. 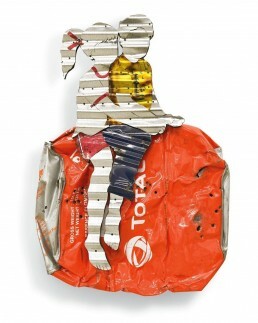 Katanani uses utensils, old rags, cardboards and tins as his art materials. Hussain Sharif is a pioneer Emirati artist who experiments with different media in his body of work. He was one fifth of the Emirati art collective Group Khamsa which was formed in the 1980’s and included fellow artists Mohammed Kazem, Mohammad Ahmad Ibrahim, Abdullah Al Saadi and his brother, Hassan Sharif. 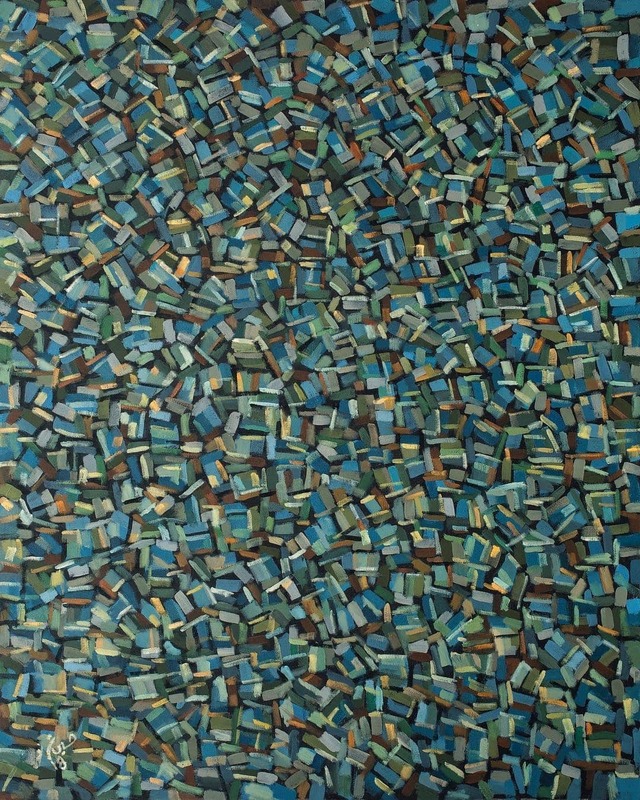 Hassan Meer is an Omani artist who explores the individualistic identity in a collective experience. He is the director of the Mascat-based Stal Art Gallery, and is known to organize and curate contemporary art shows in Oman. Meer infuses his work with different symbols of death and morality that he borrows from different cultures. 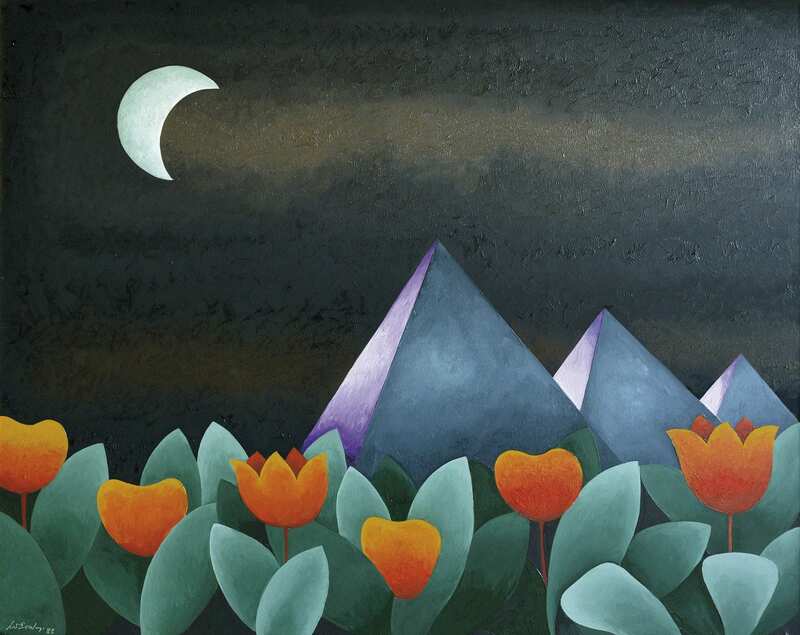 This untitled work by Egyptian artist Gazbia Sirry comes from the private collection of Mr. Zgmunt Zajdler, who organized a solo show in 1970 for the artist in his London gallery, Zaydler Gallery. 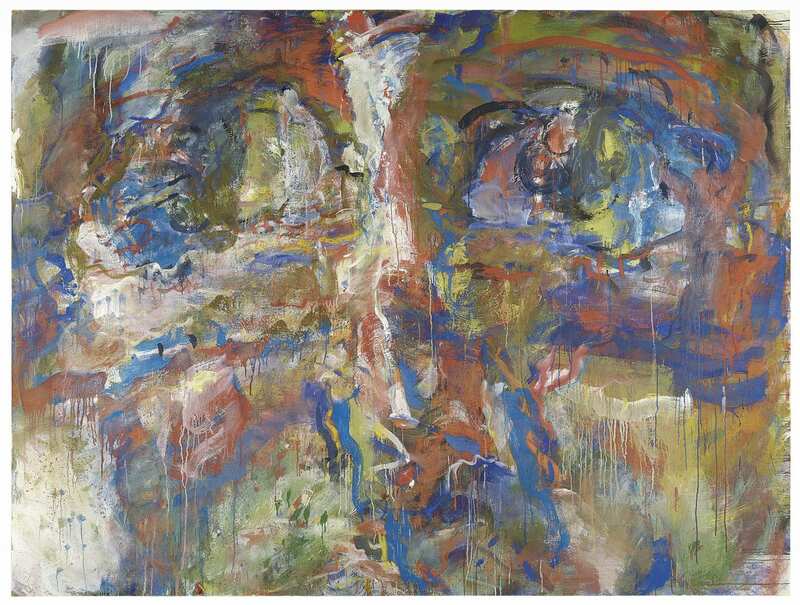 The authentication of this work is further documented in the findings of a handwritten letter the artist authored in 1970 to Mr. Zajdler about her upcoming show. 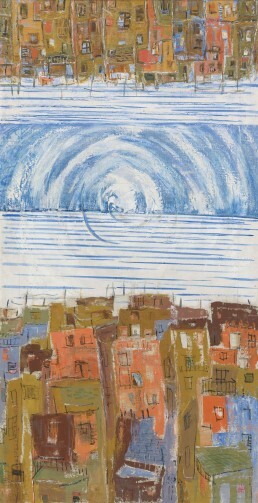 The work has a strikingly unique composition depicting the Egyptian capital by the Nile in a mirror-like image with a spiraling and cloudy presence centering the vertical canvas. With 300 exhibitions under his belt, Syrian artist Mamdouh Kashlan is the oldest living artist of his generation. He studied at the Accademia di Belle Arti in Rome between 1952 and 1957 and along with fellow Syrian artists Mahmoud Jalal and Mahmoud Hammad. 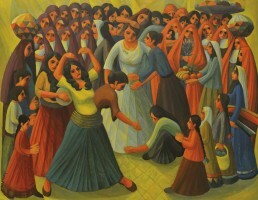 Kashlan is referred to as the artist of the people due to the recurring theme of depicting ordinary life in his work. A parfumier by profession, Willy Aractingi is a self-taught artist who is best known to depict dreamlike landscapes inhabited by animals in vivid colours. 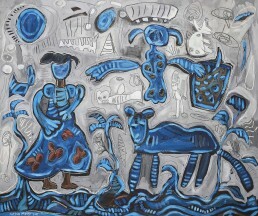 The artist who passed away in 2003 spent his artistic career drawing inspiration from classical and traditional literature including Jean de la Fontaine’s fables and the love story of Abla and Antar. In 2017, the artist’s family donated 224 oil paintings to the Sursock Museum each depicting one of de la Fontaine’s fables. 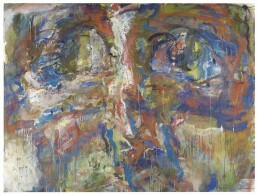 The artist worked on this series between 1989 and 1995. 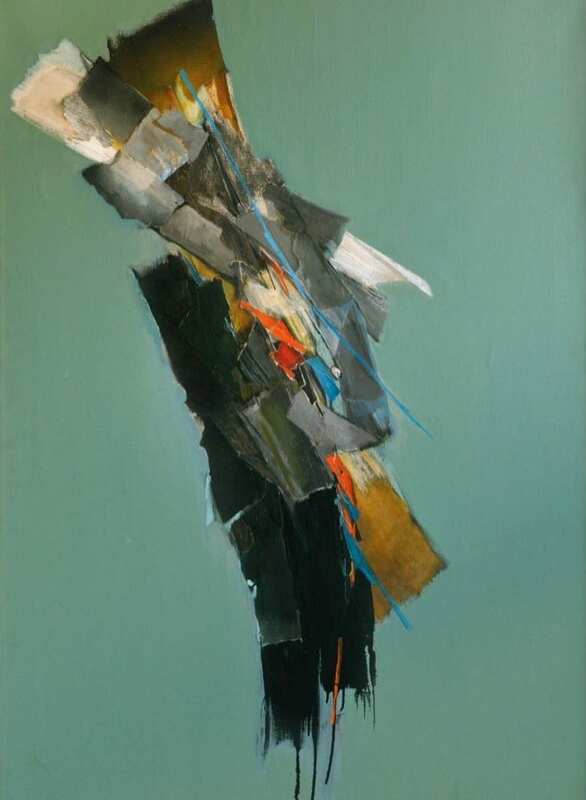 One of seven women artists represented at the sale, Yvette Achkar is a highlighted Lebanese abstract artist who taught visual arts at the Lebanese University from 1966-1988. This untitled work by Achkar is also the sale’s catalogue cover art and comes from the prestigious Al Mokbel art collection along with two other works by Paul Gargoussian and Willy Aractingi. 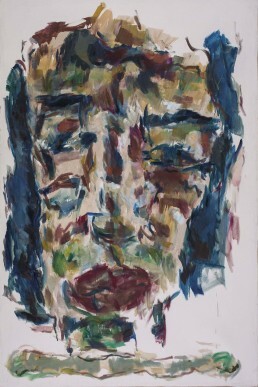 The sale offered three large-scale Marwan paintings covering over three decades of the artist’s six decade career. 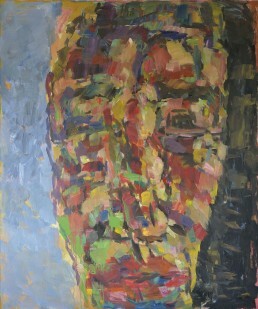 Marwan is considered the most celebrated Syrian artist. He lived in exile in Germany from 1957 until his passing in 2016. The artist was well known for his Expressionistic style of merging his Middle Eastern background with Western artistic techniques. The Syrian master was widely known to produce large-scale paintings depicting faces, or indications of thereof, dubbing his work ‘face landscapes’. 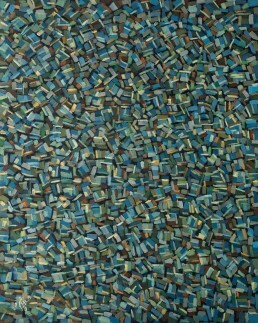 The extremely rare oil painting from Ramsès Younan, Contre Le Mur, was the auction’s grand highlight. Realising more than triple its lowest estimate, the work comes from the artist’s estate and from Younan’s surrealist phase. It is a pivotal work in Younan’s career showcasing the final stages of his figurative phase and the beginnings of his abstract years. Younan is a founding member of the Egyptian Art and Freedom society and was outspoken about Egyptian surrealism amidst the rise of Nationalism and Fascism in the region. References are from the Christie’s Middle Eastern, Modern and Contemporary Art March 2019 Auction Catalogue. Follow Suzy at mideastart for more. Follow Felix at emergingarabart for more. 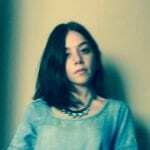 Read more from Sama Shahrouri.